BERLIN – Germany's highest court has ruled that a PETA ad campaign comparing animal slaughterhouses to the Holocaust is an offense against human dignity. The 2003 campaign used eight, 60-square-foot (5.6-sq. meter) panels depicting images of factory farms next to Jewish concentration camp inmates and the slogan "Holocaust on your plate." The Federal Constitutional Court in Karlsruhe on Thursday ruled that the ad campaign was not protected underfreedom of speech laws. PETA — People for the Ethical Treatment of Animals — claimed its goal was to compare Nazi-runconcentration camps with contemporary animal abuse. Paul Spiegel, former president of the Central Council of Jews in Germany, filed the suit against the ad campaign along with several other Jewish organizations. CHARLOTTE -- The Charlotte-Mecklenburg Police Department's Animal Care and Control Unit is setting up a pet food bank for those who can't afford to feed their animals. Officers say they've noticed an increase in the number of pets being brought in by their owners because of the cost of food, and foreclosures and evictions. Newton launched a nine-month dog park experiment at Cold Spring Park last week and neighbors are vociferously voicing their opposition, suggesting the new policy will make out-of-control situation even worse. Eve Cohen said that dogs have always been a problem at the park but it worsened last year when word spread the city was thinking about allowing dogs off leash there. A nine-month off-leash policy limited to a designated area officially went into effect Tuesday and Cohen and other neighbors are not pleased. CINCINNATI (AP) -- Some owners of dogs from Petland stores are questioning their pets' health and behavioral issues in the wake of a lawsuit claiming the national chain knowingly sold sick puppies. The lawsuit filed by six pet owners says an investigation by the Humane Society of the United States showed that many puppies sold by Petland were bred in mills. Animal rights groups say the high-volume breeding facilities harm puppies and lead to illness. The lawsuit seeking class action status was filed this week against Ohio-based Petland Inc. and its suppliers. 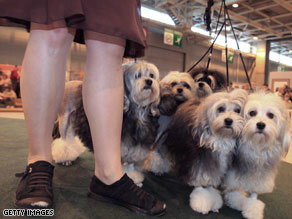 It charges that thousands of customers were intentionally misled into believing puppies came from the finest breeders. Petland says the accusations are false and that it does everything possible to provide customers with healthy, well-socialized pets. The family dog in one household in North Carolina may have been feeling the stress of the economic slump when he ate his owner's money. Augie, a 2-year-old greater Swiss mountain dog, consumed the $400 that Kelley Davis earned working overtime as a physical therapist. Davis, 42, of Apex, N.C., said she'd planned to deposit the money a week ago, but it wasn't in her pocket when she went to retrieve it. Instead, Augie "deposited" the cash in a different way over the next few days, she told FOX News on Friday. She thinks he's done, she said. What About Your First Pet? Who was your first pet? Suzie is a little white dog, cute and fluffy like all little white dogs should be. But just a little over two months ago she was sitting in a pool of bloody urine in a shelter in Ontario, Canada. Even though the shelter veterinarian had put her on antibiotics, she wasn't getting any better. A volunteer who had become very fond of Suzie asked what they were going to do next, and found out they planned to euthanize her on Christmas Eve. They didn't have the time, staff or money to figure out what was wrong with her, let alone to fix it. Have An Exotic Animal Next Door? TAMPA - Susan Williams lives among cattle ranches and a growing number of new homes. So she was more than a little surprised a couple years ago when rumors circulated that her neighbor had a tiger and a grizzly bear on his Okeechobee property. Williams' curiosity led her to call the Florida Fish and Wildlife Conservation Commission. Sure enough, the neighbor had permits for a tiger, a grizzly and four other bears. With the economy going to the dogs, meatpacking giant Tyson Foods Inc. is forming an alliance to make a product its executives think is recession-proof: deli-like food for pets. Tyson, Springdale, Ark., is expected to announce Tuesday that it bought a minority stake for millions of dollars in closely held Freshpet Co., a Secaucus, N.J., company that is rolling out refrigerated dog food to thousands of stores such as Kroger, Supervalu and PetSmart. Tags: dog food, dogs, Kroger, PetSmart, Supervalu, Tyson Foods Inc. This would not be a good country to engage in pet care,pet sitting, or even to set up veterinary practice. JIDDAH, Saudi Arabia - Saudi Arabia’s religious police, normally tasked with chiding women to cover themselves and ensuring men attend mosque prayers, are turning to a new target: cats and dogs. The police have issued a decree banning the sale of the pets, seen as a sign of Western influence. Saffie was behaving pretty badly before the owner got this cat a good video to watch. This is one way to pet sit for a while. If you live in Florida and have an exotic pet you don't want anymore, the state is offering a day of amnesty to turn it in. The big worry, says theFlorida Fish and Wildlife Conservation Commission, is that people with illegal exotic pets will simply open the door and let them go, or slip them into a local pond or river. ABC News reported the following article, and it is a tragic happening. Over all, Merry Murphy's prefers that pets remain in the safe and healthy environment of their home. Though accidents can happen anytime, you and your pet sitter will be more familiar with the risks in a familiar setting as versus a kennel. As domestic diva Martha Stewart mourns the death of her puppy, pet experts are warning owners to be extra diligent when choosing a facility to board their beloved pooches. Following the tragic death of Martha Stewart's dog as well as 16 others, animal experts offer advice to pet owners on how to find a safe kennel for their pets. Stewart's chow chow,5-month-old Ghengis Khan, was killed Friday when the Pazzazz Pet Boarding kennel in eastern Pennsylvania exploded after a propane tank ignited, setting the facility on fire. A total of 17 dogs were killed in the fire. According to reports, officials said that a spark or static electricity could have been responsible for the fire, and that while the investigation is ongoing, the incident is being considering an accident. Stewart declined to comment directly to ABCNews.com but said in a posting on her blog that she was "deeply saddened" by the death of her dog. A representative for Stewart declined to specify why Ghengis Khan was at the kennel and not at Stewart's home at the time of the fire. Just last Friday,Charlotte's Humane Society gave out free pet-food. Efforts like this are going on around the country, and people should feel compelled to get the word out to those in need. Donating food to any animal service organization would be appreciated. The Humane Society and the Charlotte-Mecklenburg animal shelter on Byrum Drive both accept donations of pet food for the needy. The city shelter recently started a Pet Food Bank in partnership with Second Harvest Food Bank. While adoptions are up at the Humane Society and city shelter, more people are also giving up their pets here and across the country in the downturn. Surrenders of dogs and cats were up nearly 11 percent at the city shelter in the last half of '08 compared to the same period the year before. For more information or to donate food: Humane Society, 704-377-0534; Charlotte-Mecklenburg animal shelter, 704-336-3786. OMAHA, Neb. - Quick action from Omaha firefighters helped save the life of a dog that was caught in a burning house. Firefighters were called to a home near 65th Avenue and Sprague Street and found that a 9-year-old shepherd-husky mix named Katie had nearly succumbed to smoke inhalation. Firefighters gave Katie oxygen from a special device designed for animals. Keep reading! Did you know that senior cats and dogs get gray hair? And that's not all that changes as pets age. From a decline in eyesight and hearing to changes in digestion and energy level, pets go through many of the same aging stages as humans. Here are 10 tips for taking care of aging pets. Post a comment to tell us how you comfort and care for wise old pets! 1. How old is "old"? Cats can begin to age noticeably as early as 7 to 8 years old, although they aren't considered truly senior until after age 10. According to the Journal of the American Animal Hospital Association, 56 to 60 years of age is considered the start of the senior years in humans. To find out how that age corresponds to dogs of all sizes, try this cool tool. Dog Whisperer is a U.S. Citizen! He's famous for turning ferocious pit bulls into family pets, rehabilitating neurotic pooches and training their owners to become pack leaders. Now Cesar Millan (aka television's Dog Whisperer) can add another accomplishment to his roster: becoming a U.S. citizen. (NECN) - Cape Cod Times reporter Jake Berry delivers the touching story of a dog who went missing after Monday's deadly fire at the Cape Cod Animal Hospital, only to be reunited with his owner. The fire killed four animals, three cats and one dog. The on-site veterinarian and a neighbor freed 12 dogs, but one went missing. That one, Dutch, was a puggle. There was little success in finding Dutch, until he was spotted at a local airfield. For more on this story, visit CapeCodOnline.com. NECN's John Moroney covered this story, as well. Everyone knows that chocolate is bad for dogs, right? Problem is, most of us think it’s only about the sweet bars of brown stuff and big bags of candy-coated goo. Not so much so. In fact, the chocolate most likely to land your dog in the ICU is a baking staple––cocoa powder. This common pantry item, along with the almost-black chunks of the unsweetened stuff, are liable to kill a dog if consumed. The recent cover-up scandal about osteosarcoma and drinking water fluoridation brought to mind research I had done several years ago into canine osteosarcoma which is fairly common among certain breeds of dogs and cats. Because of the association between osteosarcoma and drinking water fluoridation, I contacted people who’s dogs developed the cancer to see if the lived in fluoridated areas, but there was not even a credible anecdotal connection. It appeared to be a universal problem. I dropped the investigation until the new flap came up about fluoride and osteosarcoma and I decided to take a fresh look at the issue again. OSTEOSARCOMA is the most common bone cancer in humans, cats and dogs. Following last year's passage of Proposition 2, state lawmakers are pushing other bills that could have a big effect on California animals -- farm or otherwise. One such bill, introduced by state Senate Majority Leader Dean Florez (D-Shafter), would outlaw the common procedure of docking dairy cows' tails except "during an individual treatment, emergency or operation, if the treatment or operation is performed by a veterinarian for veterinary purposes" with proper anesthesia. Ken Lacasse heard the thunder of an explosion about 100 feet from his house on Cape Cod, and without thinking, he ran toward the flames. He knew dogs and cats were likely trapped inside Cape Cod Animal Hospital, which burst into flames at about 8 Monday night. "Things kept blowing up," said Lacasse, 51, who lives next door to the animal hospital in West Barnstable. "We didn't have a lot of time. We had to move quick." Lacasse found Scott Munson, the hospital's head veterinarian, at the front door. He said Munson tried to enter through the front but came back because it was too dangerous. He said that they decided to go around back and that he and the doctor broke in by pulling off several pickets of the fence and using a cinder block to break down the backdoor.